Seven sets of simulation boards. Every set can simulate multiple biomedical functions (ECG, EEG, EMG, NIBP, and etc.). Simulator and safety Analyzer equipment. 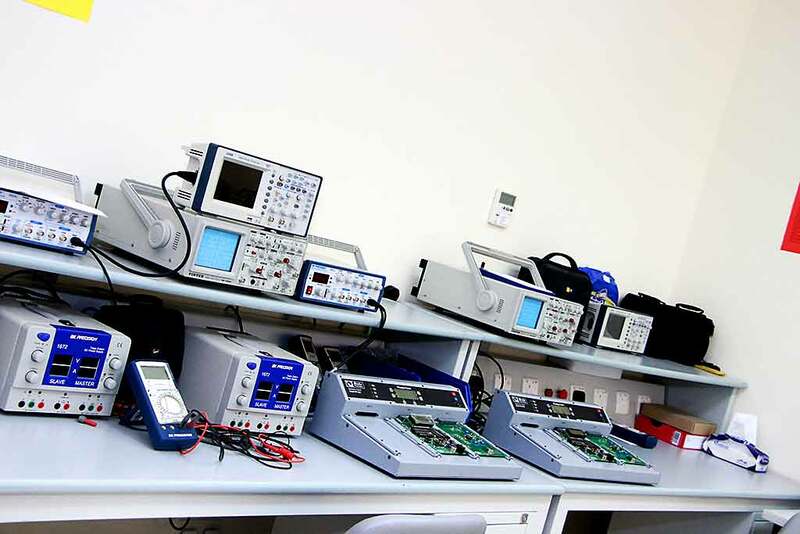 Electronic sets (Test boards, Power supplies, Oscilloscopes, Function generators, Digital multi-meters, Solder station). 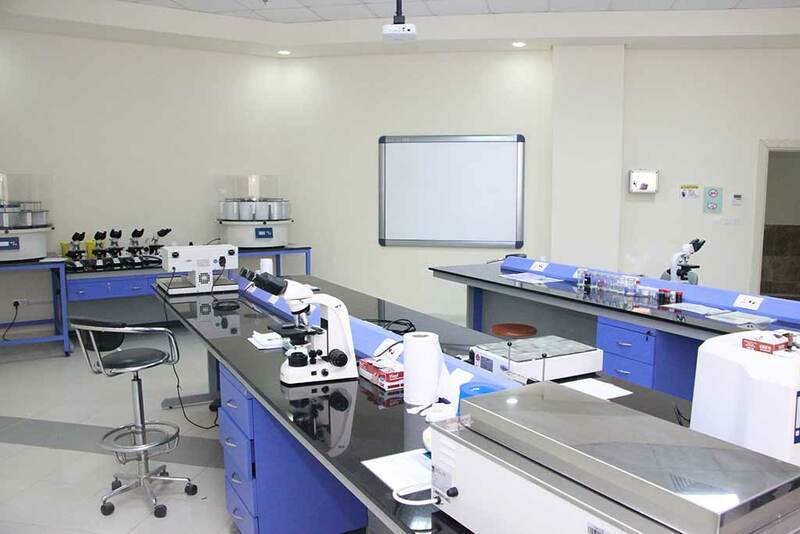 This lab is used for some BMT courses like BMT 242: Biomedical Electronics and BMT 351: Biomedical Measurements, where students are introduced and taught basics of electronics and measurements. In addition, Biomedical Signal Processing course uses this lab to teach students basic fundamentals of signal processing, EEG, ECG, EMG ventilation and medical imaging courses. The department is seeking to develop the lab and provide additional equipment’s to develop student’s familiarity with the widest spectrum of current medical devices. The CLS Laboratory Services is responsible for conducting laboratory diagnoses and investigations; according to the latest laboratory techniques; to provide the essential information used to help diagnoses, plan treatment and monitor the health. 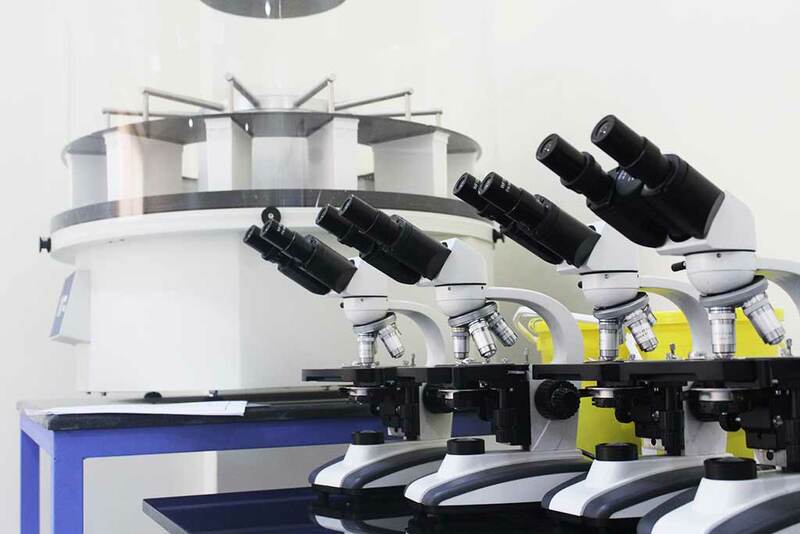 Clinical Laboratory Sciences laboratories include different disciplines divided into four major Laboratories; which are medical microbiology, clinical Biochemistry, Hematology and blood transfusions, Histology and pathology. The CLS laboratories contain high quality laboratory equipment and laboratory supplies (lab ware including glassware, microscopes, colorimeters, balances, scales, analytical scientific instruments, Biosafety cabinets, Incubator, and all Personal Protective Equipment’s (PPE) to control infections hazards and to cover all the CLS courses. The CLS laboratories can accommodate up to 20 students at once, furnished with comfortable student’s chairs, data show, AC control unit, and Medical sink. 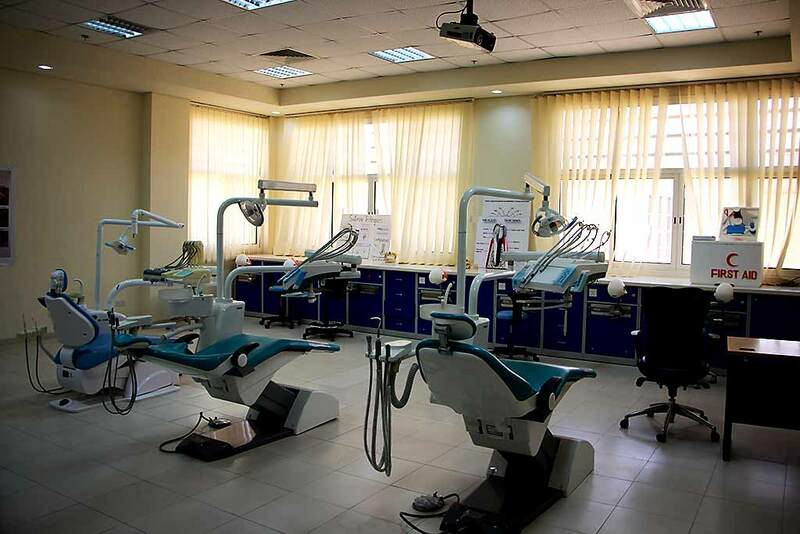 Dental health care department equipped with ten dental clinics and phantom lab containing 15 units. This equipment will help student to be professional dental hygienist. Typically focusing on in oral hygiene, common procedures are performed by hygienists. These include cleanings known as prophylaxis, scaling and root planning for patients with periodontal disease, taking of prescribed radiographs, dental sealants, administration of fluoride, and providing instructions for proper oral hygiene and care. Inaya Medical College has a program for training in Emergency Medical Services and Prehospital critical care. The EMS Department currently has seven laboratories also called skills stations. There are four in the male side and three in Female side. 20-30 students can be trained at a time in each of these laboratories. These labs are equipped with Sim Man Essential Bleeding, Sim-Junior, Advanced ACLS mannequins, Trauma mannequins, Burns mannequin with kit, Simul-aids child auscultation, Mechanical Defibrillators, Rescue mannequins and Airway Mannequins. The labs are used for EMS courses where the students are introduced and taught how to Defibrillate and manage difficult airways. In addition, these labs are used to teach students how to perform patient assessment, conduct resuscitation and train to handle normal deliveries. The lab has a projector and a projector screen too, where, aside from practical classes, the lab is also used as a lecture room especially when a lecturer would like to show the students how the equipment and machines are operated. 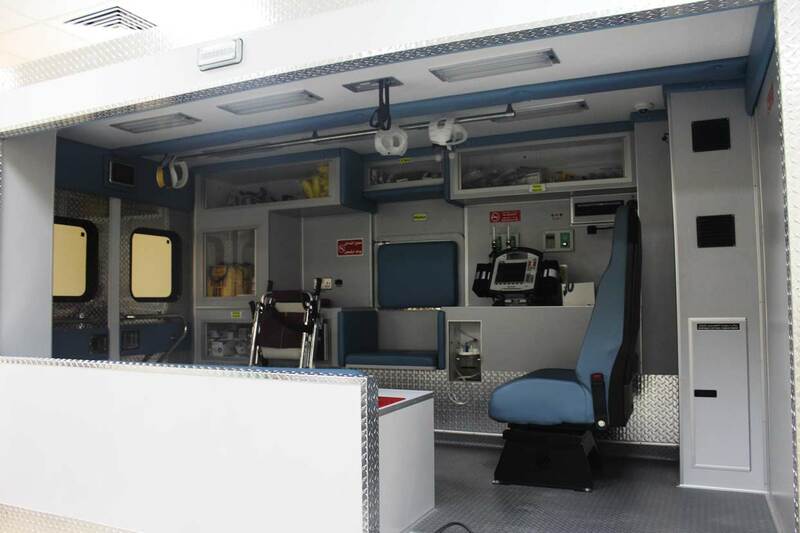 The Department further has an indoor hydraulic Ambulance simulator and a vehicle extrication training simulator (SWEET). These help reproduce life-like scenarios where Students and educators observe students perform EMS task and protocols in a realistic environment helping enhancing the training experience. A camera digital recording system makes it possible for students to review their work on a screen. Up to-date Gamma Camera equipped with five workstations for processing. Nuclear medicine hot laboratory with all the required components and devices. Partnerships with high caliber hospitals and medical centers in the field of nuclear medicine for student training and for internship. The nursing lab is equipped with the necessary facilities that are needed for students training in the practical courses. 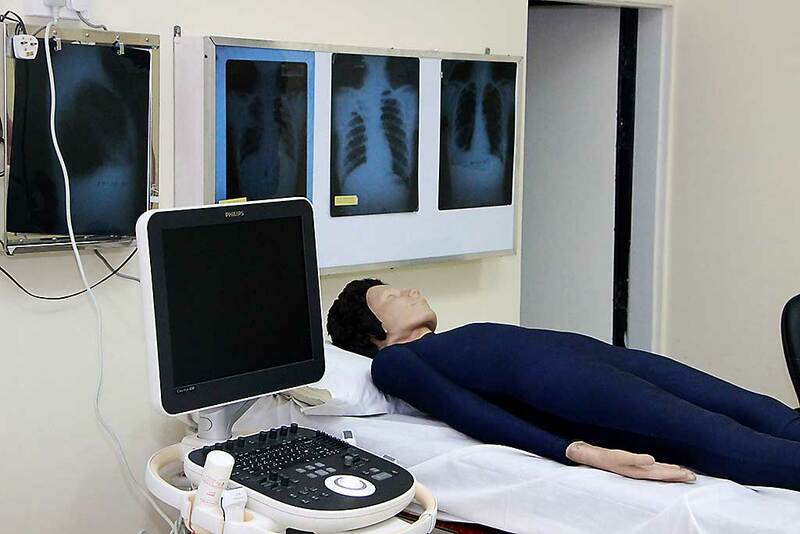 Since the beginning, the nursing labs had nursing manikins available for the maternity course, pediatric course, health assessment and adult health course. All the required materials and equipment to cover the foundation of nursing course are available such as: IV training arms, computerized IV cannulation simulators, digital and mercury thermometers, digital and mercury sphygmomanometers. Additionally, the nursing labs is fully equipped with other resources including enemas, different models of human body, electronic beds and stretchers, automated external defibrillators, CPR manikins, Diagnostic sets, surgical instruments and off course other disposable medical materials. The nursing lab can accommodate up to 15 students at once, furnished with comfortable student’s chairs, data show and AC control unit. 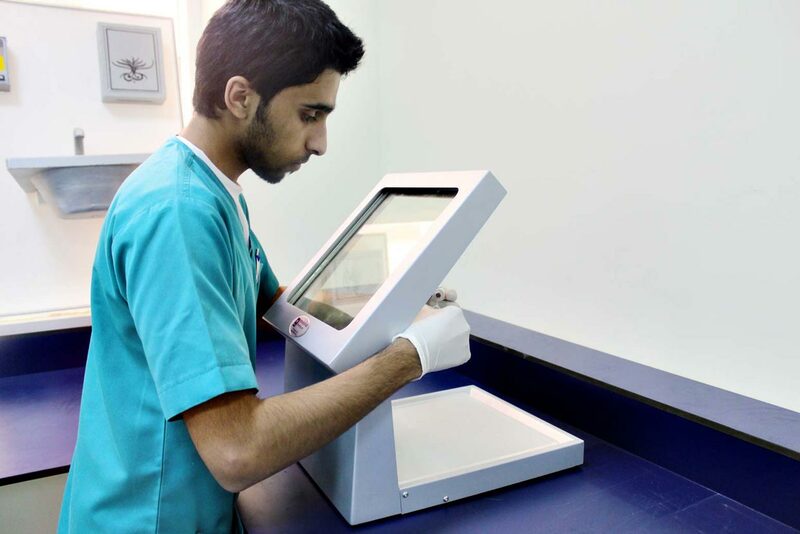 In X-ray or radiography lab, student (future radiologist) uses a very small dose of ionizing radiation to produce pictures of the body's internal structures. X-rays is the most important diagnostic tool; oldest, and most frequently used form of medical imaging. They are often used to help diagnosed fractured bones, look for injury or infection and to locate foreign objects in soft tissue. 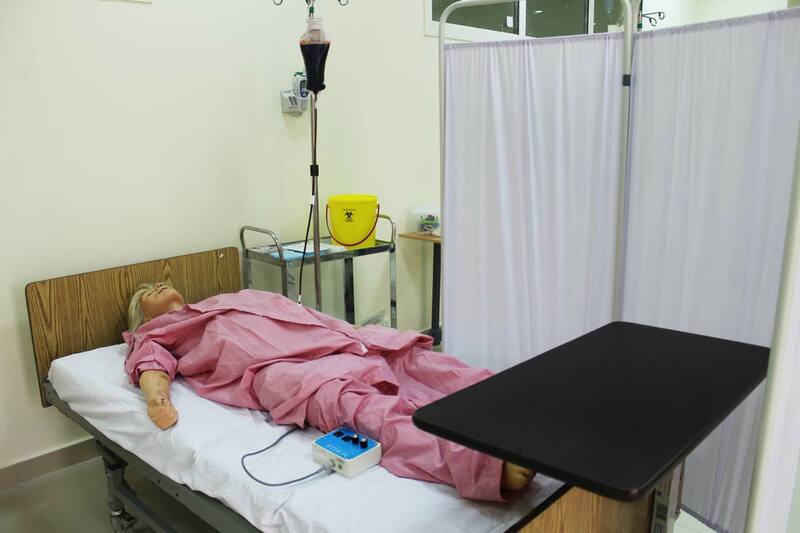 Basic skills labs are equipped with manikins and instrumentations required to help the students acquire basic clinical skills. Mechanical ventilation lab has the most current equipment used in the profession such as the Maquet Servo i Ventilator, Respironics V60 Noninvasive ventilator, which are typically used in acute or critical care settings. Furthermore, the lab contains additional equipment used in the diagnosis and follow up critically ill patients such as i-Stat Blood Gas Analyzer. Simulation center: this facility mimics real time experience with patients using highly specialized equipment and allows students to do team approach patient care. The simulation center is considered the first of its kind in the Kingdome that is designated to the field of Respiratory Therapy.